Bathrobe There are 33 products. Bathrobe with shawl collar 100% cotton. Towelling bathrobe with 1 belt and 2 pockets. Comfortable cut, soft touch, 360 gr/m², very good colourfastness after washing. Available in size S/M, L/XL and XXL. Color : grey. Bathrobe with shawl collar 100% cotton. Towelling bathrobe with 1 belt and 2 pockets. Comfortable cut, soft touch, 360 gr/m², very good colourfastness after washing. Available in size S/M, L/XL and XXL. Color : white. Bathrobe with shawl collar 100% cotton. Towelling bathrobe with 1 belt and 2 pockets. Comfortable cut, soft touch, 360 gr/m², very good colourfastness after washing. Available in size S/M and L/XL. Color : blue gauloise. 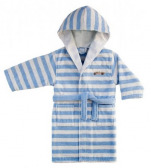 Bathrobe with hood, 100% cotton terry, length 100 cm, gray stripes. Bathrobe kimono 100% cotton. 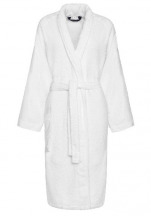 Towelling bathrobe with 1 belt and 2 pockets. Comfortable cut, soft touch, 360 gr/m², very good colourfastness after washing. Available in size S/M, L/XL and XXL. Color : white. 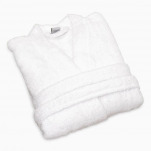 White shawl collar bathrobe 100% cotton, 430 gr/m². 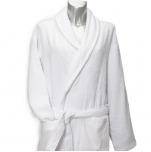 White piping along the facing ends perfectly bathrobe. The piping down to the bottom of the robe. Wash 60°C. dryer drying max 50°C, Ironing 2 points max, bleach prohibited, dry clean. Available in size S (34/36) M (38/40) L (42/46) XL (48/52) and XXL (54/56). Bathrobe shawl collar hood with inner 100% cotton terry and outer 100% cotton velour, multicolored lines of orange, red, blue, pink, green and turquoise colors on a white background, back height 115 cm. Available in sizes S 36/38, M 40/42 and L 44/46. Bathrobe shawl collar hood with inner 100% cotton blue terry and outer 100% cotton velour blue lines, 2 side pockets, back height 115 cm. Available in sizes S 36/38, M 40/42 and L 44/46. 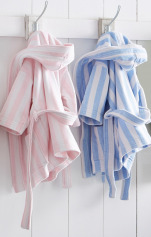 Bathrobe kimono 100% cotton terry combed, 400 gr/m². The parmenture of the bathrobe is finished with a beautiful woven braid. Bathrobe with 2 side pockets. 90 cm long. Bathrobe washable at 60°C and dryer allowed. 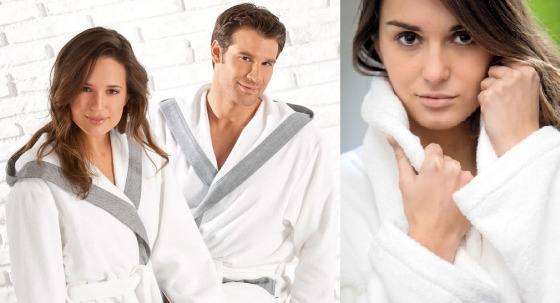 Bathrobe kimono 100% cotton terry combed, 400 gr/m². The parmenture of the bathrobe is finished with a beautiful woven braid. Bathrobe with 2 side pockets. S: 95 cm long, M: 100 cm long. Bathrobe washable at 60°C and dryer allowed.